The band – singer Nathan Hunt, bassist Matt Fisher, rhythm guitarist Josh Hamler, lead guitarist Derrick Shipp, and drummer Adam Zemanek – simply didn’t want to use anything digital, and when a certain effect was needed they approached the process creatively, coming up with solutions to reach a realized vision. As Hamler shares, “We had been so stuck in our way of writing and recording, but Keith had a different, more interesting approach to coming up with that sound. He really helped us find a fresh new creative path. Red Hands Black Deeds is a darker, visceral, and more layered sound than past repertoire. The album ranges from the ominous, haunting vibes of the title track prelude, “A Longer View “The Devil In Our Wake, and – which could fit just as easily on a horror film soundtrack as it does on this rock band’s album – to quieter, more vulnerable moments as heard on “Tusk and Bone” and “Long Way Home.” Lyrically, the band also ventured into new territory, taking on the current political, social, and economic struggles the USA is facing as a nation under the new administration. Red Hands Black Deeds touches upon the darker nature inside all of us,” says Hunt. “The whole record has a contrast and push and pull tension – a juxtaposition of good and bad or questioning what is right and wrong. The record ended up having a concept, though we weren’t intending it to,”says Hunt. The writing of the record began in November 2016 at the time of the US presidential election, so it’s no wonder there are social and political undertones to many of the songs. “The tension in the record kind of speaks for itself. There’s a dark anxiety, tension-filled feeling that reflects what’s going on in the world, The Come Up, the album’s first single, is an upbeat song that juxtaposes a Motown backbeat with classic Rolling Stones rock and roll swagger, and that delves into depression. “There’s so much negativity on social media today ‑ a lot of people struggling with real issues and with where we’re at as a nation, says Hunt. 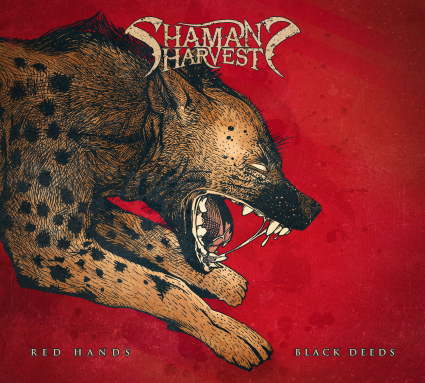 “Shaman’s Harvest Album Red Hands Black Deeds Full of Missouri Magic full of intrigues, delivers huge hooks, deep bass and powerful lyrics that have something to say wrapped up with powerful rock Shaman’s Harvest Red Hands Black Deeds delivers on every level.” wrote Bluesdoodles when we reviewed the album Red Hands Black Deeds, last year.